Fanack Home / Syria / Past to Present / Syrian Opposition Infighting, a Necessity or a Distraction from the main Goal? In 2011, when armed conflict first broke out in Syria, the country’s political and military scene was much less complicated than it is in 2015. There were two parties on the popular, political, and military field: the regime and its opponents. At the time, the term “the Free Syrian Army” was widely used in the international media to refer to any local military group that fought President Bashar al-Assad’s forces. Today, however, the picture is completely different. The Syrian scene has grown too complicated to recognize easily who is fighting whom. In fact, the Free Syrian Army (FSA), has never been an actual army; it never had a unified military structure or leadership. Since the beginning, it has been nothing more than several separate armed groups, each of which had its own leadership, financial resources, and strategy. Four years later, nothing is left of the FSA but a few moderate Islamic or secular armed groups. Numerous attempts have been made to unify these groups. The most significant endeavor has probably been the creation of the “Supreme Military Leadership of the Free Syrian Army,” but this body did not exist for long, as many groups defected from it, either to form new alliances or to merge with other better financed groups. When the Islamic Front was established in November 2013, for instance, three major groups of the Free Syrian Army in northern Syria (Liwaa al-Tawheed, Suqour el-Sham, and Jaish al-Islam) split from the Supreme Leadership in order to join the newly established Front. The Islamic Front is currently one of the most powerful military groups fighting against the regime in Syria. With approximately 60,000 fighters, mostly Syrians, the Front controls the entire eastern Damascus countryside (al- Ghouta al-Sharqiya), parts of the southern Damascus countryside, and vast areas of northern Aleppo, as well as several enclaves in other rebel-held regions. Aiming to establish a post-Assad Islamic state, the Islamic Front is basically an alliance of a number of smaller groups including Ahrar el-Sham, Ansar el-Sham, Suqour el-Sham, Liwaa al-Haq, Liwaa al-Tawheed, Jaish al-Islam, and the Kurdish Islamic Front. According to the Washington-based Carnegie Institute, the Islamic Front is probably supported by Saudi Arabia, Qatar, and Turkey, although there is little evidence for this. 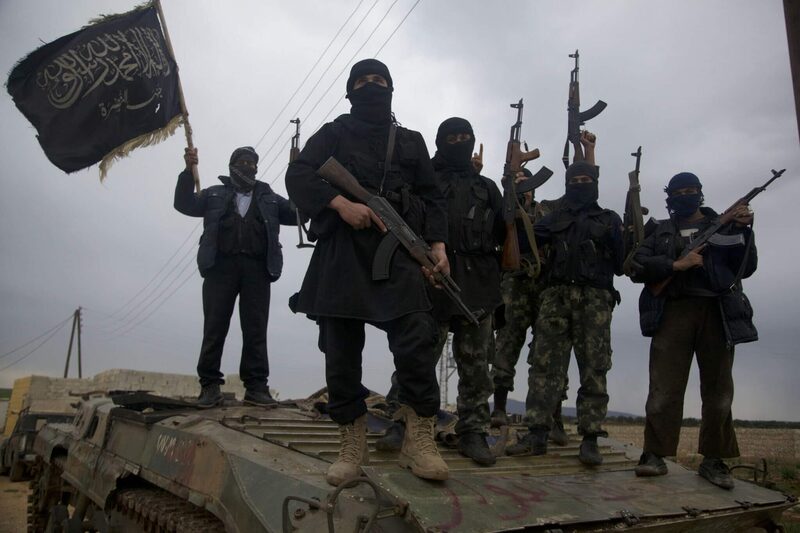 On the same side of the spectrum, but more extreme, is the al-Qaeda-affiliated Jabhat al-Nusra. According to a report by Stanford University, al-Nusra ranks second after the Islamic State (IS) in attracting foreign fighters. “These fighters mostly come from the Middle East, but also from Chechnya and European states, with a smaller number from more distant countries like Australia and the United States,” says the report. Although smaller than the Islamic Front, al-Nusra is well financed and has been effective in fighting the regime since the early days of the conflict. It has been responsible for many suicide attacks that have cost Assad many lives and considerable material losses. Nevertheless, the Islamic State is still probably the most terrifying force on the ground and the one with the largest area of influence. The group emerged in April 2013, after defecting from al-Qaeda, and managed in a few months to capture vast areas of western and northern Iraq and northeastern Syria. In June 2014 IS proclaimed a caliphate in parts of Iraq and Syria. IS has tens of thousands of fighters, most of whom are not Syrian. The first clashes among the anti-Assad armed groups date back to mid-2013. At that time, a bloody fight broke out between al-Nusra and several FSA groups in the north. Observers saw the battle as a sign of a revolution against al-Qaeda’s presence in Syria. Also, in March 2013, no sooner had the FSA and the Ahfad al-Rasoul brigades captured the city of al-Raqqa (in the northeast) than IS launched an attack against them and took control of the city, which now appears to function as its de facto capital. Although both al-Nusra and IS subscribe to the fanatical Salafist ideology that recognizes no international borders, the two groups engaged in bloody confrontations between mid-2013 and mid-2014. Their battles were over the IS defection from al-Qaeda and over the oil fields of the al-Hasaka region, in northeastern Syria. According to the London-based Syrian Observatory of Human Rights, thousands of Nusra and IS fighters were killed fighting one another. Today, IS stands out as a common enemy of all the anti-regime forces in Syria, except al-Nusra. So far, IS has fought more battles against the Syrian armed opposition than against the regime. The latest of these confrontations was IS’s bloody fight against the Kurdish People’s Protection Units in Kobane, which managed to hold its lines only with the heavy air support from the US-led anti-IS international coalition. IS has never been in an actual alliance with any other Islamic or non-Islamic groups. Only recently, news reports have indicated that the group had, after long enmity, reached some sort of peace understanding with al-Nusra. One manifestation of that understanding occurred early in April 2015 in the district of Yarmouk, south of Damascus, the site of a large Palestinian refugee camp: al-Nusra helped IS invade Yarmouk and eliminate the opposition groups that had been controlling it. Al-Nusra has fought numerous fierce battles against FSA in the Syrian north. The most recent example of these confrontations was al-Nusra’s war against FSA’s Hazm Movement in February 2015, a war that al-Nusra eventually won. However, al-Nusra has been pragmatic: the group has made many truces with other opposition militias, despite its grudge against secular powers, and al-Nusra has been cautious about initiating fights against other opposition groups. In fact, al-Nusra has fought side by side with other groups. In March 2015, an alliance that brought together al-Nusra, the Islamic Front, and other opposition groups under the name Jaish al-Fatah was able to drive the regime out of the city of Idlib (in the northwest). According to several observers, al-Nusra has so far been focused more on fighting the regime than on fighting other opposition groups. The most significant confrontation within the anti-Assad groups is still that between IS and the Islamic Front, given the size and power of these two factions. The two groups have become bitter enemies and have fought dozens of fierce battles with one another. Their first clashes date back to 2014, when IS abducted and killed several leaders of the Ahrar el-Sham Movement.The confrontation between them has continued since then and is unlikely to end soon. Some observers believe that the infighting among the anti-regime forces is exposing them to Assad’s forces, making the West more hesitant to intervene on their behalf, and harming attempts to reach a peaceful solution. Other analysts see this kind of infighting as inevitable. Advocates of this view believe that it is more urgent for the moderate powers to fight extremists than to fight the regime itself. However, there has been a consensus that the differences among the regional and international financers and among their agendas will continue to fuel the strife among the various anti-Assad factions and that a solution can be found only when the external parties agree on a course that meets everyone’s interests.